In this interview, James Galea tells us how he spends every day having the best day ever! He also talks about how he’s put together shows like the Band of Magicians, pitching his ideas, and getting funding for his visions. 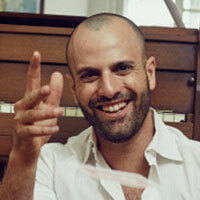 James Galea is an award-winning magician, writer, songwriter, director and producer residing in both sunny Los Angeles and sunny Sydney Australia. Trying to make every day his best day ever, he’s literally traveled the globe performing his magic. He’s the creator of and has toured with the acclaimed “Band of Magicians,” performed at corporate events for the likes of Microsoft, Virgin, Ford, and Disney, and he’s headlined worldwide in places like the Edinburgh Fringe Festival, The Hollywood Magic Castle, and the Melbourne International Comedy Festival. You may have also seen him on one of his many TV appearances on the Ellen DeGeneres Show, The TODAY Show, Good Day LA, his own series Urban Magic, or starring in the Discovery Channel series Breaking Magic along with fellow magicians Wayne Houchin, Billy Kidd, and Ben Hanlin. James tells us about the most dismal failure that anyone could have on stage. Literally. Everything went wrong! James describes it in excruciating detail. Whatever he’s working on right now. • Talks about his musical about a magician. • How he started the Band of Magicians and his vision for it. • How he promoted the Band of Magicians to get butts in seats. • How he raised money for the show. • How they’re different from The Illusionists. BAND OF MAGICIANS – Short Film from James Galea on Vimeo. Trusting his instinct and knowing what’s right to do. That and telling people no. • Being a life-long learner. • How he spends every day having the best day ever and how he discovered that philosophy for himself. • His first experiences on cruise ships. • How he marketed himself early on. • Learned by doing and observing. Be careful who you listen to and take advice from. Where can we find James Galea? ← Enter to Win: Journal of Alchemy by Joe Diamond!